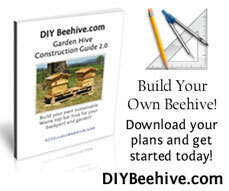 In one of my recent posts I talked about feeding your bees in the early spring. Well, my method works fine if the weather is warm enough for your bees to be flying around outside the hive. But, how can you feed your bees if the weather is too cold for them to leave the hive? Not much is worse than checking on a beehive…and seeing a lot of baby bee cells in with your honey. You can’t get the honey out without killing the baby bees. And you can’t get the baby bees out without ruining the honey. So how do you keep the baby bees out of the honey?